Readers are advised to study the bent four in the corner and the rectangular six (if they have not mastered them) before reading the contents of this page. White can kill Black unconditionally by playing at a. 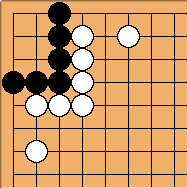 After , Black can't play at a or b because of shortage of liberties. Black is dead. When there is exactly one outside liberty, the best White can do is to make it an approach ko. The vital point is at a. 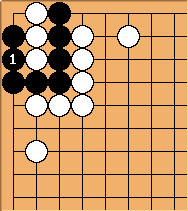 Black's throw in at is necessary: if White gets to play there she makes it a bent four in the corner. starts the ko. 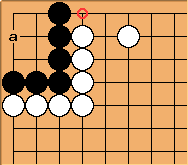 If Black wins this ko, by playing again at and then playing at a capturing the two White stones, the position is settled with Black living in the corner. 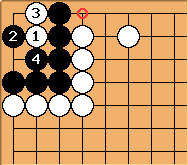 Should White win this ko by connecting at . 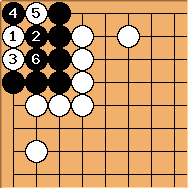 Black captures four stones at a and White sets up a direct ko for life as shown in the next diagram. With one outside liberty, this fails. Black can play because in this case he is not in atari. When there are at least two outside liberties, Black is unconditionally alive. The sequence is copied from the main line in the previous paragraph. 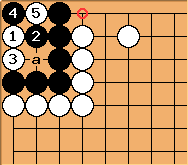 Now Black can play the surprising move of (oshitsubushi) because he still has at least two liberties. 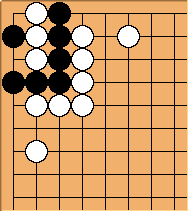 White cannot connect at so Black will play there to make two eyes. 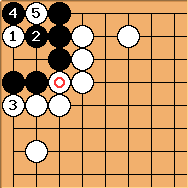 If is in place, the weakness of the connection enables White to create a ko. White takes first with . In this diagram, Black is dead. No, this is not a seki. Why? After and fill up all the outside liberties, the stones are caught in a connect-and-die. If prevents the connect-and-die at any point of the game, he turns his group into a straight three big eye instead and dies in gote. 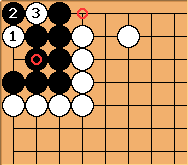 : One could argue that, this being the case, White might as well fill the outside liberty in the main line diagram instead of connecting at there; but then Black is the first to capture the second stage of the ko and here it is White (try to get first capture in a ko).